“Kau Lāʻau and Maʻamaʻa: Traditional Hawaiian Ulua Fishing” is a half-hour documentary about the traditional ulua fishing practiced by Hawaiians from Kalapana village on the Big Island of Hawai‘i. It features three generations of the Hauani‘o family, who still use the spectacular technique called kau lā‘au, hang-baiting, to catch the largest ulua weighing up to 100 pounds or more. 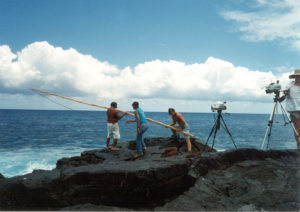 The film follows Uncle Ben, his nephew Aku, and Aku’s son Kainoa, as they make an ‘ohi‘a pole, dye the line, and catch eel for bait. When everything is ready, the fishermen head down to the isolated coast. 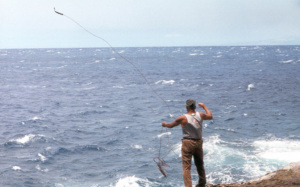 There the pole is wedged into a cliff above the sea, and then a hook baited with eel tail is suspended from the pole down to the white water below. Sometimes the fishermen throw out a ma‘ama‘a handline as well. Kau lā‘au was widely practiced before World War II, when Uncle Ben was growing up. Today it is little known, but Aku is trying to pass on the traditional knowledge and skills to his children. Declining numbers of ulua and increasing competition from fishermen who use new techniques now make it harder to catch ulua in the old way, and harder for Aku to pass on his knowledge. This is a story about trying to maintain Hawaiian traditions and values in a changing world. It was created in collaboration with the fishermen and they provide most of the commentary. Shot over a nine-year time span on location in Hawai‘i Volcanoes National Park, the dramatic scenery provides a backdrop for the respect the men have for the sea, the fish, and traditional Hawaiian customs. Executive Producer Charles Langlas is the co-author of two books about twentieth century Kalapana, Under the Volcano: The People of Kalapana, 1823-1950 and He Mo‘olelo no Kapa‘ahu/Story of Kapa‘ahu. Writer, director and editor Kate Sample has produced documentaries and news magazine shows in Hawai‘i since 1987. She wrote and edited The Volcanoes of Hawai‘i, which aired on the Discovery Channel. The DVD (including the film itself (27 min 37 sec) plus an interview with fishermen Ben Hauanio and Aku Hauanio by Charles Langlas (1 hr 24 min)) is now available only to libraries, schools, and non-profit organizations. Contact us for a copy.